“The Saskatoon berry is known as a service berry in eastern Canada and gets a name change again when it crosses the border into some U.S. states. In Michigan and Minnesota, the delicious berry is known as the juneberry, which is what the variety found in the northeast U.S. is called. Researchers at Cornell University found that Americans loved the taste of Saskatoon berries, but the name didn't resonate as well as juneberry. To capitalize on their thirst for the small purple berries, some U.S. marketers are asking Canadian growers to change their labeling. We were at the Saanich market in the fall and many people we talked to were appalled at the idea of changing the name from the Saskatoon berry to a June berry! The domestic Saskatoon berry is very different from the wild variety many of us are so familiar with. 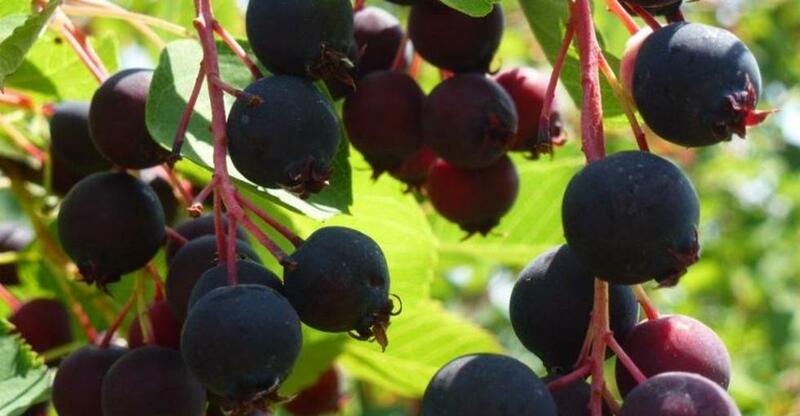 There are a few different varieties of Saskatoon berry trees including the Northline, Smoky, Thiessen and Honeywood. At our farm here in Cobble Hill, we have Northline for a couple different reasons, one being, the trees hold onto their berries longer giving us a chance to get them harvested before they fall on the ground!  The domestic Saskatoon has been selected, otherwise, based on its fruit size, taste, yield, flowering time and overall productivity. 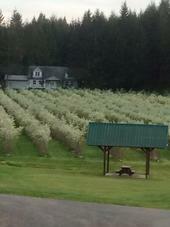 A domestic orchard can yield 4,000 pounds per acre. There are still some pretty good patches of wild Saskatoons around but they won’t yield what the domestic tree will. We have seen some Saskatoons blooming here on Vancouver Island. I have seen them along the shoreline in our area. They stand out, especially when they are blooming about two weeks later than our domestic ones around the 3rd week of May. On the prairies, many orchards are not watered while they are producing. That’s because the snow captured in the rows is enough to sustain the tree. Here, the only time we irrigate is when we use our drip irrigation system to deliver water to the trees while the berries are filling. The berry from the Saskatoon was an important food source for both indigenous people and the early pioneers. Today Saskatoons are used in a wide variety of ways from pies, jams, jellies, syrups, ice cream toppings, wine, liqueurs and flavour concentrates. 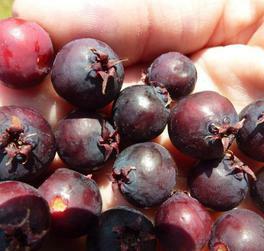 Saskatoons can also be used in baked goods like muffins and fruit crisps. They may be used fresh or frozen and can be dried to yield "raisins" or fruit leathers. Thankfully, deer don’t care for Saskatoons trees or berries! Birds can cause problems in the orchard, and we have used a bird scare device (sounds like a hawk) but as long as the birds eat the whole fruit and don’t damage it and leave we are okay to share with them! It is concerning, however, when you can watch a flock of birds disappear into the orchard! 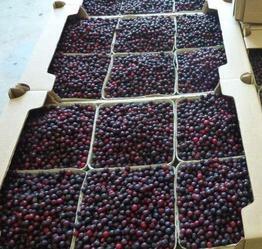 From a nutritional perspective, Saskatoon berries contain a very high source of fibre. A 3/4 cup (100gram) serving of frozen Saskatoon berries contain 6 grams of fibre or 24% of the daily requirement. There have been numerous studies and research done on the nutritional values of high antioxidant content fruits that help to fight cancers and heart diseases. Recent research indicates that Saskatoon berries have higher levels of antioxidants compared to other more common berries such as wild blueberries, strawberries and raspberries. Saskatoon berries are also a source of 5 essential vitamins and minerals.